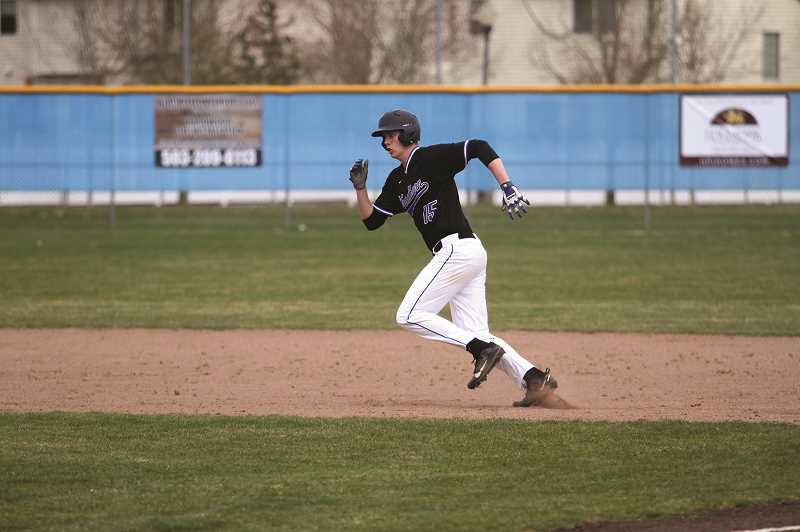 The Woodburn baseball team was looking to get its first league victory of the season under its belt against the Sweet Home Huskies last week, but will instead have to wait until April. The Bulldogs were swept in the team's three-game series to open its Oregon West Conference schedule, falling 9-1 at home to the Huskies on March 18, followed by back-to-back losses of 11-1 and 16-4 on Wednesday and Thursday, respectively. Returning home on Thursday for the final game of the week, the Bulldogs appeared to regain their offensive swagger after putting up just one run each in their first two games against the Huskies. After giving up a run in the top of the first, Woodburn returned the favor in the bottom of the inning with three runs of their own. Leadoff batter Ethan Ing opened the game by drawing a walk, and after junior Jaden Bellman struck out, Ing stole second during teammate Jose Ortiz's at-bat. Ortiz then hit a grounder, reaching first base safely on a Sweet Home error that helped move Ing to third to put runners on the corners. Junior Reese Miller followed with a fly ball single to centerfield, scoring Ing to tie the game at 1-1 and moving Ortiz to third. After senior E.J. Barajas struck out on the ensuing at-bat, junior Georgio Bustamante hit a two-out line drive single to center field that brough in both Ortiz and Miller, giving Woodburn its first lead of the series. Carter Nelson flied out to left field to end the inning, but the Bulldogs tacked on one more run in the bottom of the second when Ing stole home to make it a 4-1 game. But the Huskies took it all back in the top of the third, scoring three runs to tie the game at 4-4 before the Bulldogs were able to get out of the inning on a double play. After a scoreless half for Woodburn, Sweet Home got back to work in the fourth inning by going 13 consecutive batters with a hit, walk or hit batter, scoring nine straight runs to make it a 13-4 game before the Bulldogs recorded their first out. Sweet Home made it 14-4 before the end of the inning, and after a quick bottom half for Woodburn, added two more in the top of the fifth to bring the game to its final margin of victory. Ing led the team offensively, going 1-for-1 with a walk and two runs scored. Ortiz was 2-for-3 with a run scored, while Bustamante drove in a team-best two RBIs. Woodburn (1-4, 0-3 Oregon West) was scheduled to compete in the Franklin Tournament over spring break, opening on Monday, March 25 against the Benson Techmen (0-1) before taking on the hosting Quakers (2-3) on Tuesday, March 26. The Bulldogs wrap up the touranment on Thursday against the Roosevelt Roughriders (0-3).